Good question, and it will cost Norwegians an estimated $100 million to recover and repair its warship, but that’s minor compared to the damage that could be done by more military mistakes within its borders. In 1949, Norway joined NATO, and NATO nations have since enjoyed its “nuclear sharing” largesse, by which member nations without nuclear weapons of their own participate in nuclear force planning, train their armed forces to use nuclear weapons, and store nuclear weapons in their territories. 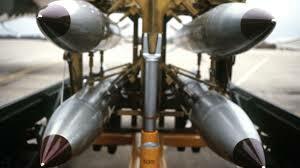 United States Air Force (USAF) personnel guard the nuclear weapons “shared” with NATO nations, and the codes for deploying and firing them also remain under US control. In October 2016, Norway voted against a UN nuclear disarmament resolution, saying that it “will not support proposals that would weaken NATO’s role as a defence alliance.” A month later, a Russian official warned that Norway, which shares a border with Russia, had become a nuclear target due to the deployment of 330 US Marines in its territory. “Five or six years ago, this would have been science fiction. Nobody would have accepted this was possible, but it is entirely logical. This is the escalatory cycle of Cold War thinking. We are in the New Cold War, and each time these exercises will grow larger. The thinking in the original Cold War was that the scale of the exercise was a way of intimidating and in some fashion backing off the enemy. So the Russians conducted most recently a Vostok exercise in easternmost Siberia with the scenario of an invasion of Korea by an unnamed foe, meaning the United States. Now that was an exercise combining Chinese troops and Russian troops to fight this unnamed foe. Now the American troops and 30 other countries conduct an exercise to fend off an unnamed foe named Russia. These are very serious people. Curious claim—that the US is not prepared to fight Russia—given that the Stockholm International Peace Research Institute ranks Russia’s military budget as the fourth greatest in the world, after those of the US, China, and Saudi Arabia, and one-tenth the size of the US military budget. Are Americans being conned by the Pentagon and the military industrial complex? Of course we are, and that’s among the greatest understatements of the 20th and 21st centuries. Weapons manufacturers who profited from Trident Juncture and all the rest of the US-financed NATO operations are no doubt laughing all the way to the bank, while Russia remains determined not to bankrupt its people in an arms race with the US, as the Soviet Union did. Indeed. It’s a major world power, a nuclear power, and a permanent member of the UN Security Council with veto power. And it continues to build alliances with other powerful nations, most importantly China and Iran.